EP5000SS Smooth & Silky Women's Rechargeable Epilator. This is a good epilator for someone looking for an inexpensive model, but only if they don't mind the longer time it takes to get your skin silky smooth. If you want a faster epilator, you will need one with more tweezing units. This unnit has 2 speeds and will run for up to 60 minutes before needing to be recharged. Features a moisturizing strip, a curved tweezer barrel, and massaging skin stretchers. It can be used corded or cordless, and comes with a 2 year warranty. This Epilator is made by Remington and designed to get your skin silky smooth and remain that way for up to four to six weeks. You can shave cordless for up to 60 minutes without recharging. Unit has a 2 year limited warranty, and includes an extra shaving head cartridge. The blades are nano-silver coated blades which help to keep your hair from regrowing as nano-silver reduces the growth of microorganisms. Features include 2 speeds, a curved tweezer barrel, skin and massage stretchers, and a curved tweezer barrel. 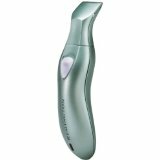 Epilator by Remington WPG-250 Trim and Shape 5-in-1 Precision Grooming Kit. This Epilator works without irritating from your head to your toe. It is sleek and ergonomic making it easy to use. Attachments included are a cosmetic trimmer, mini-groomer, 2 adjustable length combs, and a precision trimmer. There is an LED charging indicator in the rechargeable handle. Kit also includes a cleaning brush, charging adapter, and a storage pouch.